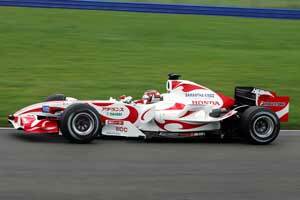 Aguri Suzuki, Christian Danner and Martin Brundle were at various times in their careers team mates and rivals in Formula 1 but the trio will be all on the same side today at Silverstone as they take it in turns to test drive a Super Aguri SA06. Aguri will run the car to see just what a handful it was for his drivers in 2006 while Brundle and Danner will be filming their adventures for British and German TV respectively. Brundle and Danner were F1 team mates with the Zakspeed team back in 1987 while Brundle went on to team with Suzuki at Ligier in 1995. Danner and Suzuki both drove for Arrows but at different times.